Injured Toe Nails Can Happen Anywhere! Ask any Accident and Emergency Department and they'll probably tell you that a high percentage of accidents occur in the home, especially in the bathroom and kitchen. This is not suprising, as the bathroom normally has wet, slippery surfaces, and the kitchen has table and chair legs, sharp knives and hot cookers! We are also more likely to be walking either barefoot, or just wearing socks in the home, not shoes. Drop something heavy, and it will focus in on your foot like a guided missile! Podiatrits often joke that the little toes evolved to detect any small, undetected object on the floor, and work very well in conjunction with the shins! So it's no small surprise that many toe and toe nail injuries I see have occured in or around the home environment. Please note this article contains photo's of an injured toe nail, before, during and after a treatment. As podiatrists we see and deal with these types of nails day-in and day out, and give patients a great deal of satisfaction and comfort from our treatment. HOWEVER, some more sensitive people may not wish to view the images, so click here to return to my home page. 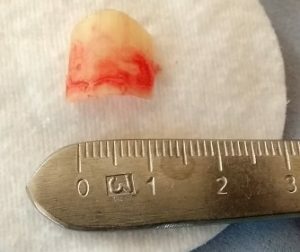 As always, I would like to give my thanks to my patient, who very kindly let me take and use the photo's of their toe in this article, along with their permission to write about this incident. It's always a great opportunity and a priviledge to be able to share such images and education on what can be done to help people,. Without the consent of my patients, this would not be possible. A patient of mine contacts me, as she's injured her her big toe. I ask her what has happened, and she explains she's been in the kitchen, opened her oven door, which has caught her big toe nail, and it's causing her quite a bit of pain and discomfort. I'm in clinic all day, but I have already planned for a home visit after clinic, so I advise I'll call at tea time, so she will be comfortable for the rest of the evening. After completing my planned home visit, I arrive at my patient's house, expecting to find a very bloody toe, with a nail mostly attached, but loads of swelling! What I found what quite different! What has actually happened is the oven door has caught the very end of the nail, and very quickly and cleanly lifted the nail away from the nail bed. Very little blood! 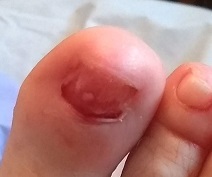 I'm actually quite impressed, because when I perform nail surgery to remove an ingrowing toe nail, I need to inject local anaesthetic, wash the toe down with an iodine solution, carefully loosen the nail from the nail fold and then use a surgical instrument to carefully lift the nail from the nail bed. The process takes a good 10-15 minutes. My patient has done this in one swift movement in about 2 seconds flat! I'm very impressed! Her nail is just hanging on by the nail fold, and she's getting pain / discomfort simply from the nail pressing into her toe, stopping her from wearing any slippers (an item which would have helped prevent this occuring in the first place - but we've all been there before). My main task was to loosen the very last part of the toe nail from the nail fold. As this was still attached, I had to do this with a scalpel, to cut the nail free. Now the nail has been removed, there is still a basic wound to be cared for, so the wound is cleaned with a sterile solution, and then dressed with an iodine dressing, and then a sterile dressing and tube bandage, fixed in place with medical tape. This is to keep the nail bed clean from infections and and protect it from further damage. People stub their nails and loose them quite often. But the human body is very resistant, and will re-grow your nail. As your nails grow at the rate of 1mm a month, it can take several months for a nail to re-grow, depending on the size of the nail. 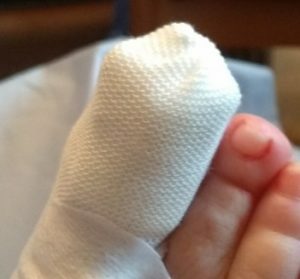 If a toe nail is damaged by a crush, i.e your toe is crushed by a horse, or a heavy object dropping on it, or being stood on, there is a risk of the nail bed becoming damaged and a nail growing back unevenly or thickened. However, when the nail is stubbed and shunted on the toe, there's a high chance of the nail growing back normally. In many cases, the first re-growth is uneven, but this often grows out smooth. 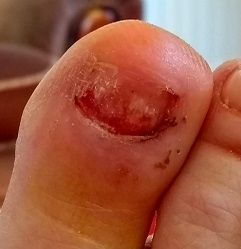 If you experience an injury to one of your toe nails similar to this, the best course of action is to wash the wound with sterile or clean water (bottled water is as good as anything). Then secure the nail to the toe using an elastoplast, or similar dressing. This will prevent further trauma. 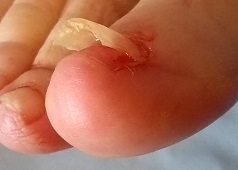 For similar nail injuries, read my article on Runner's Toe. If you are diabetic, or have any vascular complications such as raynaud's or chilblains, then seek professional medical attention as soon as possible. If you have any questions or queries regardings foot pain and trauma or foot health, please feel free to get in touch or book an appointment with me.